Crystal River Elementary School teacher Jennifer Carney (center) listens to speakers during the rally outside the district office in Glenwood Springs. Dendy Heisel speaks to teachers, parents and supporters during the teacher pay rally outside the district office in Glenwood Springs. Glenwood Springs High School teacher Stephanie Wagner rallies with other teachers and supporters outside the district office in Glenwood Springs. 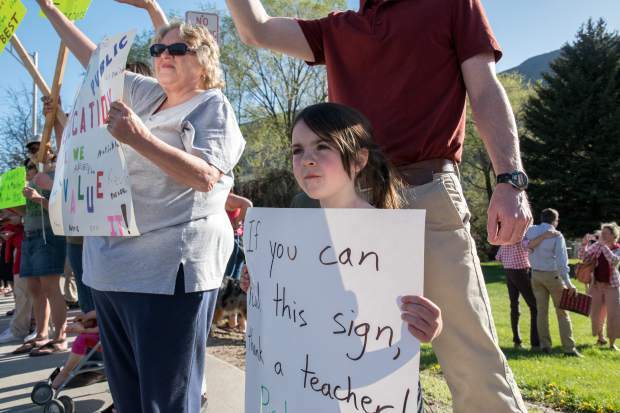 Five-year-old Sofia Norville rallies with parents, teachers and supporters in front of the district office in Glenwood Springs. 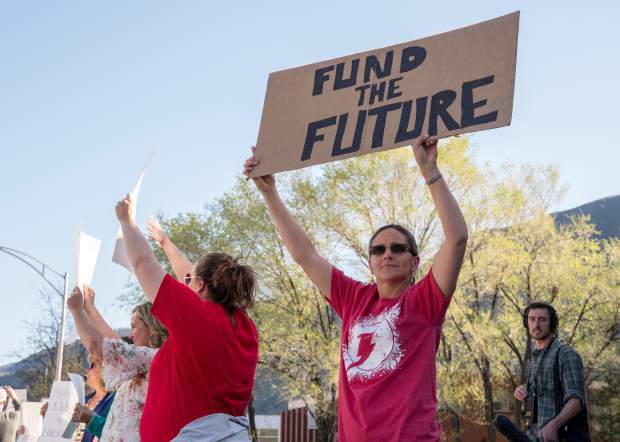 Teachers, parents and supporters rally together in support of higher teacher pay and school funding in front of the district office in Glenwood Springs. Sopris Elementary School teachers Kat Warder and Talitha Basom have each others’ backs today, as thousands of teachers are expected to rally in Denver for better teacher pay and education funding. 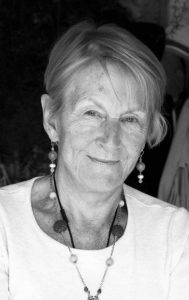 While Warder will be at the state Capitol lending her voice to the statewide cause, Basom will be at the Glenwood school as usual this morning gathering up her students for a field trip to the Science Museum in Grand Junction. 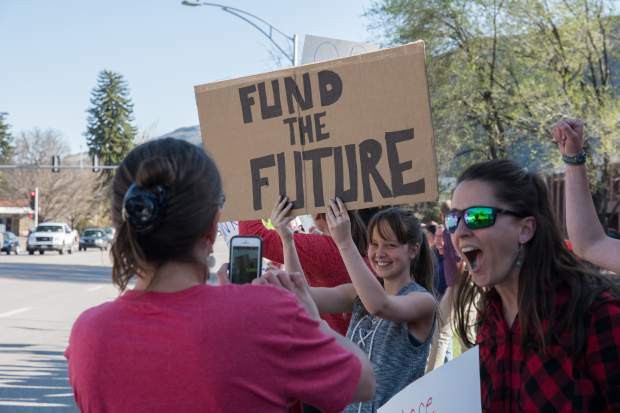 About 100 teachers, Roaring Fork Schools administrators, members of the public and students turned out for a local rally Thursday evening outside the district offices in Glenwood Springs. The event was organized as a precursor to the big demonstration in Denver today. Some Front Range school districts chose to cancel school today in anticipation of a mass teacher walk-out to attend the rally. 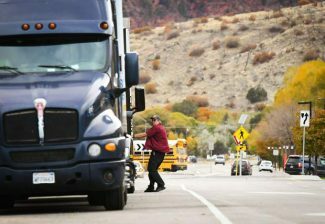 Locally, however, Roaring Fork Schools opted to allow a delegation of four teachers from each district school in Glenwood Springs, Carbondale and Basalt to head to Denver, while others were asked to stay behind and teach so that students would not have to miss a day of learning. “I’ve been teaching for 16 years, and I wish Colorado would pay like Texas does,” said Basom, a third-grade teacher who got her start in her home state of Texas but wants to stay in Colorado. 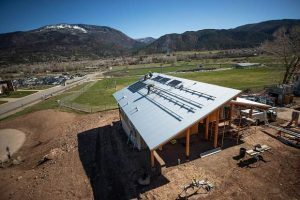 “I’m single, and I rent, but I would like to own my own home here someday and have a family,” Basom said during a rally outside the Roaring Fork School District Offices Thursday evening. Warder will be one of the Sopris Elementary representatives at the state rally. “I’m going there for them,” she said, holding up a collage of student pictures from her school. “We need more funding, and we need to be able to retain our teachers, because the turnover only hurts them,” Warder said. Likewise for Glenwood Springs High School teachers Greg Sustad and Brent Wamsley. Sustad is part of their school’s delegation that’s headed to Denver, and Wamsley will stay back home to teach. “Obviously, I value the action that’s being taken,” Wamsley said. “Just the idea that we’re among the last in spending for education, yet our growth is toward the top of the country speaks for itself. 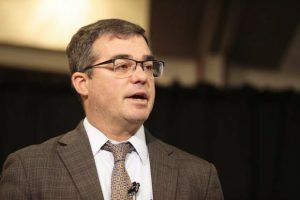 With a $1.2 billion surplus in available state funds this year, Sustad said a good portion of that needs to go to education. “It’s hard to make a living wage in this valley, so I’m here tonight and I’m going to Denver tomorrow in support of raising teacher salaries and increasing funding for education,” he said. Based on the revised data from the National Education Association just this week, Colorado’s ranking among the 50 states in terms of per pupil funding is actually 31st, and not 46th, as previously reported, according to teacher Rhonda Tatham, who is president of the Roaring Fork Community Education Association. The average Colorado teacher salary is $51,808, placing the state below the national average by 15.2 percent, she said in a prepared statement sent out before Thursday’s Glenwood rally. To fill the classroom gap today, even Roaring Fork Schools Superintendent Rob Stein will be picking up a social studies teaching assignment at Glenwood Springs High School for the day. 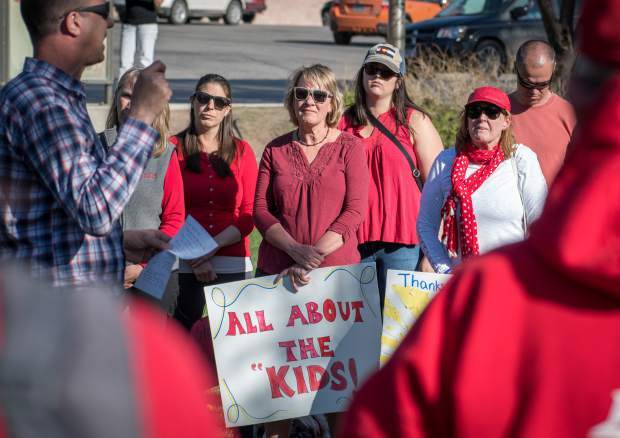 Roaring Fork school board member Matt Hamilton attended a smaller rally in Denver Thursday morning, and said he supports the teachers and other education workers who will be at the state Capitol today. Carbondale Middle School student Quinn Wells also attended the Thursday rally with her two teacher parents. “I just think that education is really important, because there are a lot of kids around the world my age who don’t even get to go to school,” Wells said.